Robert E. Howard Days: Howard Days is Six Weeks Away! Howard Days is Six Weeks Away! With Howard Days only six weeks away, June 10th & 11th are looming large for the hordes of Howard fans who are making plans to join us for The Best Two Days in Howard Fandom. Reading and poking around this blog will provide you with the necessary info for a wonderful weekend filled with panels, tours, exhibitions, auctions, featured guests and events - and this year there's even a full length feature showing of The Whole Wide World! We certainly hope to see you with a Texas sized smile on your face, but even if you can't show up in Cross Plains, you can still help Project Pride extend the Legacy of Bob Howard for the whole (wide) world by making a small donation. Your money will help keep the Robert E. Howard Museum up and running throughout the year, is tax deductible and greatly appreciated! And money isn't the only way you can help! Friday night at Howard Days features our Celebration Banquet. This year our Guest of Honor is Michael Scott Myers, screenwriter of The Whole Wide World and he'll be making his keynote speech at the Banquet. But another fun aspect of the Banquet is the Silent Auction. This is another way of donating to Project Pride, as 100% of the proceeds from the Silent Auction goes to the Robert E. Howard Museum.. And it's a way you can help the Legacy of REH without leaving your home. Many of you reading this have Robert E. Howard books, magazines, comics, artwork, 3D art, paperbacks and all sorts of REH related items in your collections that would be perfect for the Silent Auction. Some of us have duplicates of our Howard items that would be also be perfect for the Silent Auction. So, make yourself feel good by donating these items to Project Pride, won't you? Or, you can Paypal a monetary donation to: ProjPride@yahoo.com. Any amount is greatly appreciated! Thanks so much for your generosity! We plan on keeping the Legacy of Robert E. Howard alive for many years to come because of fans like you! 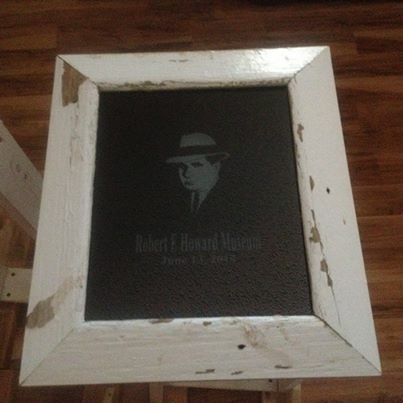 Shown above: an item from a previous Auction: etched glass and a frame made from materials of a damaged window from Howard's actual writing room! Rumor has it there may be one in this year's Auction!